Chop all the vegetables to bite sized pieces. Mix in a large salad bowl with chopped parsley. Top with sirene cheese (a lot of it!) and drizzle with sunflower oil, vinegar, and a dash of salt and pepper. Enjoy. 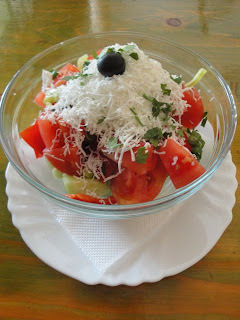 When John and I traveled in Greece, practically all we ate was this salad and wonderful bread.